There are 26 Assisted Living Facilities in the Neenah area, with 9 in Neenah and 17 nearby. The average cost of assisted living in Neenah is $3,550 per month. This is higher than the national median of $3,346. Cheaper nearby regions include Oshkosh with an average starting cost of $3,465. To help you with your search, browse the 99 reviews below for assisted living facilities in Neenah. On average, consumers rate assisted living in Neenah 4.1 out of 5 stars. Better rated regions include Appleton with an average rating of 4.2 out of 5 stars. Caring.com has helped 5 families in Neenah find high-quality senior care. To speak with one of our Family Advisors about assisted living options and costs in Neenah, call (855) 863-8283. Located in Northeastern Wisconsin on the banks of Lake Winnebago, Neenah is a town of about 25,000, with around 13 percent of its residents over the age of 65. To serve its aging population, there are nine assisted living facilities located in the city itself, with an additional 18 options available in the nearby communities of Appleton, Menasha and Kimberly. 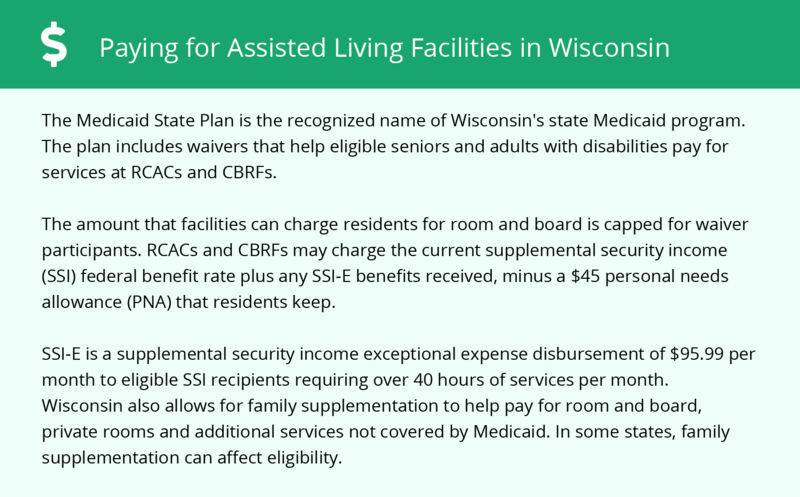 The Department of Health Services is responsible for licensing, registering and certifying all assisted living facilities within the state of Wisconsin. With 19 routes, the Valley Transit system not only serves the municipality of Neenah but also connects residents to the surrounding communities of Appleton, Buchanan, Grand Chute, Kaukauna, Kimberly, Little Chute, Menasha and Fox Crossing. Individuals 65 years of age and older are eligible for discounted rates on fares and passes. Neenah also has a Dial-A-Ride service that provides scheduled door-to-door transportation for seniors. A low crime rate means seniors can go about their daily lives with peace of mind. At an average of 12.3 on a scale of 1 to 100, with 1 being low crime, Neenah's rate of violent crime falls far below the national average, which sits at 31.1. In fact, Neenah is ranked as the 15th most secure small town to live in across the United States. At a score of 90, the cost of living in Neenah falls well below the U.S. average rating of 100. The low cost of living makes Neenah an affordable option for seniors. Like much of Wisconsin, Neenah experiences cold winters. While summer months can reach temperatures of 81 degrees, winter lows fall to 10 degrees, with 41 inches of snow expected each year. Neenah has an array of community resources for seniors, including Valley VA Senior Care, an organization that seeks to provide seniors with the opportunity to engage in enriching activities. Although Neenah is home one of ThedaCare's Regional Medical Centers, the town has few facilities from which to choose in the event of a medical emergency or illness, with the nearest major hospital located in Appleton. Assisted Living costs in Neenah start around $3,550 per month on average, while the nationwide average cost of assisted living is $4,000 per month, according to the latest figures from Genworth’s Cost of Care Survey. It’s important to note that assisted living rates in Neenah and the surrounding suburbs can vary widely based on factors such as location, the level of care needed, apartment size and the types of amenities offered at each community. While the Medicaid State Plan will cover certain personal care services, seniors may have to explore other means for financial support. 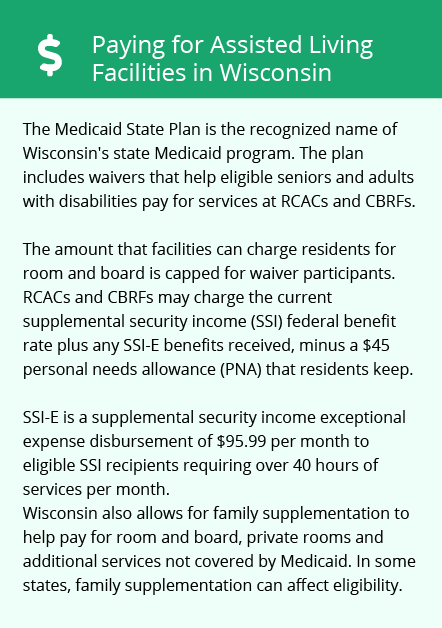 Wisconsin is one of only six states to use non-Medicaid state-funded programs as well as Medicaid to provide some services in a residential care setting. The Aging & Disability Resource Center of Winnebago County (ARCD) offers information and assistance for seniors to explore care options. Neenah and the surrounding area are home to numerous government agencies and non-profit organizations offering help for seniors searching for or currently residing in an assisted living community. These organizations can also provide assistance in a number of other eldercare services such as geriatric care management, elder law advice, estate planning, finding home care and health and wellness programs. To see a list of free assisted living resources in Neenah, please visit our Assisted Living in Wisconsin page. Neenah-area assisted living communities must adhere to the comprehensive set of state laws and regulations that all assisted living communities in Wisconsin are required to follow. Visit our Assisted Living in Wisconsin page for more information about these laws.